Dark, elemental, and mischievous, the music of the Handsome Family mines the deep vein of fatalism that runs through traditional American music. (The Chicago Reader memorably said, "As songwriters it's the eerie, ancestral voice of ‘Anonymous' they ultimately resemble the most.") Playing a range of songs that veers from gothic country to love songs, the husband-wife duo of Brett and Rennie Sparks write much of their own material and perform it with strong, mellow vocals and deep harmonies, accompanying themselves on guitar, keyboards, bass, and banjo. Founded in 1993, the Handsome Family is currently based in Albuquerque. The duo has toured extensively throughout North America, Europe, and beyond, and Handsome Family songs have been covered by artists from Andrew Bird to Christy Moore. 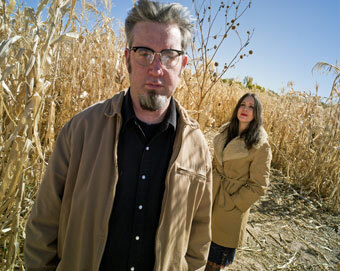 While Brett and Rennie are justly famous for their great stage shows and winning deadpan humor onstage, their albums (most recently, Scattered) have also won great critical acclaim, with consistent inclusion in "Top Ten" and "Essential Albums" lists everywhere from Mojo to the UK's Guardian.